1. As I was on my way down to the waterfall, there were times that I would wonder if I had somehow gotten off the trail and ended up in some kind of creek...the water was running across the trail in spots. I thought of how often in my life things would not quite seem right, but I didn't always stop to check to make sure I was still on the path I intended to be on. Often I would ignore the signs and keep on - only to later find I had gotten off of the right path, and ended up somewhere I didn't intend to go. 3. Then there were the areas where the trees would get really thick and the sunlight could barely come through...making it almost look like night. Very tempting at those points to just turn around and give up. And I think of the times and circumstances when my life gets too busy, or too crowded from the things going on - whether good or bad - and I lose sight of my focus... sometimes even want to give up. It's so easy to forget that there is daylight coming and keep on with the journey at hand. I just got back from several days at the beach, and the weather was beautiful. It would have been impossible to ask for prettier days (and nights). But again, walking down the sand at the edge of the ocean (something I LOVE) could get a little less enjoyable when you stepped on one of the sharp broken shells...and the beach was covered this trip. But I reminded myself to watch where I was stepping... pay attention to what was going on around me... and when I did step on one to remember that the pain wouldn't last forever. Hmmm... I'm catching on! I just wanted to say Thank-you for reading my page... I share my heart on here, as if I were talking to a friend. I have no idea who even reads this page, but I appreciate that you read and especially that you come back. You are always welcome to click the "follow" button or just drop in whenever possible. I would always love to hear your story or your comments - and you can send those to me at my email address donnakay@photographybydonnakay.com. I've learned that we are never alone in our experiences in life...there is someone else out there who has shared that experience or those feelings - and sometimes it helps just to know that much! One favor -- if you do like my blog (either of them) the best way to help me would be to share it with your friends... If you want to help me grow my photography business, "Like" my Photography by DonnaKay facebook page (link is on this blogpage) and share it with your other fb friends. Again, thanks so much for reading...and hope to hear from you soon! Have a great day! Have you ever had someone say something mean or hurtful - only to hide behind the phrase "I'm just being truthful"? This happened to me a while back, and it hurt more than I could ever express. The deliverer was someone very close to me (like a sister) until all of this, and then everything changed. Sadly, what happened made it very clear how this person really felt about me for a long time, and I had to make a choice that was one of the hardest I've had to make -- to walk away from a friendship at that point. I'm a fighter - I fight for those I love. I'm the last one to ever give up. This person I'm talking about was dealing with some issues that were their own personal deep-rooted issues, and I knew that what they said to me was really because they were avoiding dealing with what was really going on inside of them, but rather they were lashing out at me. Yet knowing that didn't lessen the hurt, or clear the boundaries that were <very> crossed, or fix the deep damage that many of their words caused. They were dealing with some jealousy and immaturity, and they were angry at me for choices they had made in their own life. It really hurt. After thinking about it a bit more, it actually began to make me angry. All of this was several months ago, and I was very careful about every word I said (both spoken and written) because I wanted this person to know that I truly loved and cared for them...but also that some real boundaries had been crossed by what they had said and how they had acted. Anyone around me knows that I constantly remind everyone "I'm not perfect"..."I've made plenty of my own mistakes, and continue to make mistakes all the time"..." but I also have been through many experiences in my life, and have learned much from them. I'm a personality who believes no bad experience - no matter how bad - is wasted. We have opportunity to learn and grow stronger and wiser...and we have opportunity to share and help others through those lessons learned. When I was a younger and much more naive person, I used to believe friends would always be friends, love would never end, someone who truly loves you would never break your heart. But I have learned that just isn't always the way it is... some people come into our lives for just a season and pass right on through. But they often leave an imprint in our hearts that lasts forever. No matter what, we shouldn't waste the opportunity to learn from the mistakes, hurts and disappointments. From this I definitely learned to be careful with saying "I'm just being honest..." and make sure that what follows is not something selfish on my part or being said in any way to just hurt the other person. If I'm not saying something to them that they can learn from, grow from, find encouragement from...if the "honesty" is just my opinion rather than actual truth, and if speaking it is from a spirit that is anything other than truly Christ-like, then maybe I should keep it to myself. Maybe I should actually work on what is inside me. Don't you hate it when you know you are getting sick? Friday I knew I didn't feel great, and by that evening I remarked "I am pretty sure I'm getting sick." My daughter had been sick most of the week with a bad cold, and the baby to whom I am Mimi had been with me for the weekend before and was sick with a bad cold. So the timing was just right if I was to come down with that cold. But my Saturday was planned - a day out with my camera to the Blue Ridge Parkway. Out to capture some shots of waterfalls, and just enjoy the beauty of the drive along the Parkway. I pushed myself through that day - even hiked several miles (oh, yea - there's a difference in performance when you are sick and have a fever!) - but I got through the day. Sunday was also planned - I was Mimi for the day, and a 13-mo old doesn't have mercy for you just because you aren't feeling well! But last night when those plans were all done and behind me, my body let me know that I am sick - and it was now time to rest. I'm already to the place of not being contagious, but my body needs some rest to feel better. So today is my sick day. I'm not a very good sick person. In fact, I'm a horrible patient. But that's not what I'm really blogging about. So I'll move on from that path. Because I don't feel well, I knew I needed to get something to eat this morning, and even my morning latte didn't sound good... so instead it was a cup of hot tea and some toast. I was toasting a couple of pieces of bread, spreading the Smart Balance and then some peach preserves on each piece, when all of a sudden I started to cry. Not just a few tears, but sobbing. Part of me was thinking "where in the world is this coming from" and another part was "yep, girl...you have definitely finally lost your mind!" I sat down with my toast, though, and let what was really in my heart have my mind. (This may sound crazy - but this is my blog, so I get to make the rules!) I was thinking about my Grandmother. Making toast when sick makes me think of her. You see, when I was a little girl I spent lots of my time with my grandparents (actually, as much as possible!) My Grandmama and Granddaddy hung the moon in my little eyes. I was the firstborn grandchild, and I knew I was a princess in their castle. My Granddaddy wasn't too sure he wanted people to think he was old enough to be a grandfather when my Mom was expecting me (he was very young...everyone in my family has been pretty young having their kids) - but once he laid eyes on me, I could have called him anything I wanted. Just as long as I loved him and knew he loved me. I am pretty sure my Grandmother, on the other hand, adored me from long before I was born. Anyway... When I was somewhere around 3, I was there with them for a stay and they were both sick. Sick to the point that they needed to stay in the bed. (I've learned in having my own kids that at that age - it's nearly impossible to be sick with a small child around.) But I was different. They told me they were sick and had to rest, and I had to play quietly. Knowing they were sick, I must have seen somewhere that sick people ate toast. So I dragged the toaster, a loaf of bread, butter and jam into the bedroom... I found a box to place the toaster on (I mean, floors are dirty!) and I proceeded to make them toast with butter and jam whenever they would wake up, and the rest of the time I had my books to look at and I would sit quietly. All I can really remember other than making and serving them that toast and jam was that they were better very soon. And it had to be because I had taken such great care of them. Believe me, they paid me back throughout my life...always taking care of me and loving me beyond words or understanding. There was never a lack of love with them and I never questioned my place or importance in their life. The only thing I did to deserve their love was to be born...and I never felt there was really anything I could do that would lose their love. This being said, I also knew they would discipline me if I needed it...but in this there was never question of their love for me - only proof. With all of the bad things I have been through in my life, I could actually write novels based on my experiences. But the saddest and most traumatic day of my life was January 16, 2002, when my Grandmother was killed in a car accident. It is a day I will never forget - because in some ways a huge part of me died along with her that day. She was so much a part of who I was...and who I am today. Hardly any day goes by that doesn't include some thought of her...but there are those moments when a memory is triggered (such as this morning) that I have to pause and sob over missing her so very much. My Grandmother taught me so much about unconditional love and forgiveness. She was no pushover, by far. She was a very passionate and strong woman who would speak her mind - and she always spoke truth. You always knew if you made her angry or disappointed her...but you always knew that she loved you; that she prayed for you; that she would do anything she possibly could do for you. She would give someone her last dollar - and she would take care of someone sick even if she could barely stand how bad she felt herself. She was a woman of self-sacrifice. My Grandmother was the strongest woman I knew...she was no stranger to heartbreak or hard work...and she never ran from either of those. Rather, she accepted that they were a part of this great life...and part of the plan God had for her life. I have no doubt that I will see my Grandmother again. She is singing in the choir in heaven right now and making friends with anyone that will stop to talk...no question about it. I can still hear her contagious laughter...she laughed through everything. I learned how to be a strong woman from my Grandmother. I learned how to be a real Christian from her life. And I am so proud of the qualities in me that came from her...whether they were inherited or developed. There is no one I would rather be compared with than her...and I hope at the end of my life I leave anything of the legacy that she left from the life she lived. I would imagine that whenever I am sick...or even if I just want toast...that there's a great possibility it will make me cry. There are many other things that bring this great woman to my mind...and I miss her terribly. But these tears are not just sad tears, they are happy tears that God chose her to be my Grandmother...and I see that as just more proof of how much He loves me! 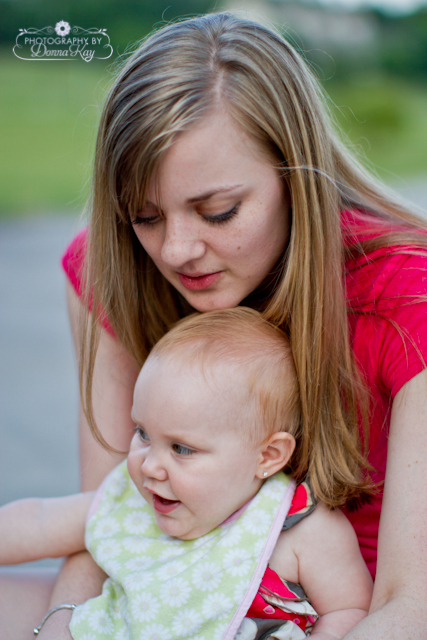 This is a photo of my daughter - and baby B (she's 13-mos-old and to her I am Mimi)... we had her outside last night so she could ride around in her new wagon. 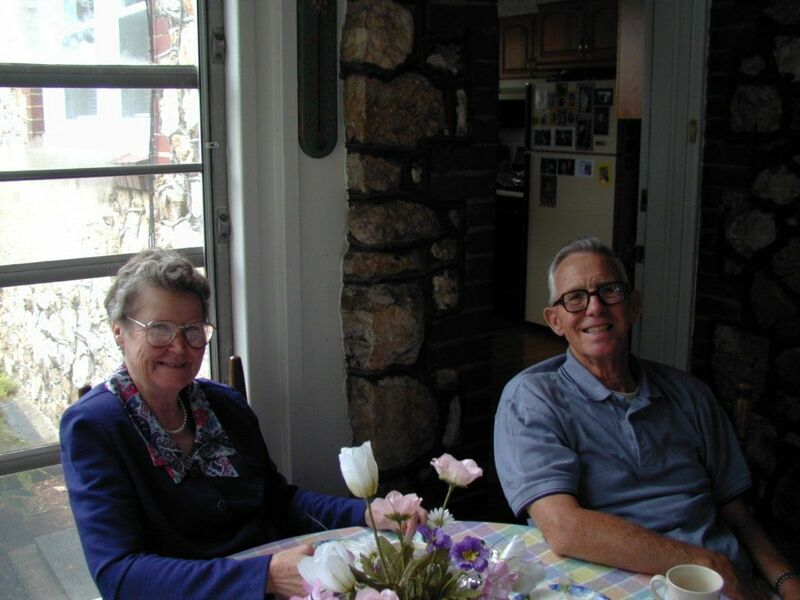 This is a photo of my Grandmama and Granddaddy...Lenora Christopher Swink and Kenneth E Swink, Sr. Losing her has greatly affected us all...but my Granddaddy lost the love of his life, and sometimes I believe he also lost his focus. I'm sure not a day goes by that his heart doesn't ache all the time over missing her. Most every little girl has that dream that she will one day grow up, the Prince will ride up on his white stallion and carry her off to live happily ever after in their beautiful home and they will have children that are perfect. But most every woman (and man) grows up and finds that it just doesn't usually work that way. Now, please don't think this is me tearing apart the institution of marriage - just the opposite, actually. My issue is that I have come to feel that too many people (most people) go into marriage with no realistic view as to what they are entering. They stand up in front of that pastor, or judge, or whoever, and they hear "do you take...for better or for worse..." and they say "I do." But then they enter the real world of marriage. Hopefully they get to experience lots of "better" and minimal "worse"... but often life just doesn't work out that way. People gain weight, they lose their hair, things shift...but beyond that, children add demands, stress and take away sleep (and money! ); or sometimes children don't come; sometimes children are sick; bills come every month; houses need repairs and replacements (cars too! ); jobs can be lost - or changed; people get sick...sometimes very sick; people can get bored or tempted or just stupid. Now I promise I won't talk about anything that I haven't been touched by in some manner during my adult life (and years of marriage)... so that leaves the playing field pretty wide open. The jist of what I'm trying to say is that marriage is tough. Marriage can be the greatest relationship in life - it is designed to give us that one person whom we go through life with and share our life in the most intimate way. But there should be some test beforehand. They should have out a sheet asking anyone who wants to get married to read, review and fill in the blanks. And the blanks should be under the heading "Better or Worse" and then listed below all of the things that might possibly fall under those categories. To pass the test, you must successfully fill in a definition of each of these possibilities... making sure you understand what you are agreeing to exactly. Now the better is not too tough, although it amazes me that relationships have actually broken up because of jealousy because a wife would do better financially than a husband. But that is another blog - and certainly not what I'm talking about. My concern today is the "Worse." I don't remember anyone going over these with me before I said "I do." In considering what is the "worse" you could be dealing with, some of the things I've listed above. But in real life, how do you deal with that point in marriage where you are bored...where you just don't see stars when you kiss - or your knees don't turn to jelly? Isn't that in reality maybe the "better" - to be so close to someone that you are that comfortable with them? What do you do when you have a sick child that demands every possible sacrifice that could be asked of your life? What do you do when you find your spouse is cheating (possibly again)? This line of questions could go on and on - and maybe it should. I think often about what my kids have learned from my experiences in marriage - and on one hand it wouldn't surprise me if they never got married. They have seen unfaithfulness, abandonment, selfishness, stupidity, humiliation, deception, lying, heartache, tears, promises broken (to name a few). But I want to think they have also seen forgiveness, restoration, commitment, humility, repentance, etc. And I have taught them along the way that marriage is about sticking in through the "worse"... not going in counting on the better. Often I wish someone had sat me down and talked about the possibility of what "better or worse" could mean - but the honest truth is that I would not have listened to them anyway. Back then I was a dreamer and a complete romantic (of the idiotic kind... there is a difference!) -- it was only through living life that I've found out I believe in marriage vows - not because the other person deserves it, but because I want to be the kind of person who lives up to my promises. I believe in commitment. I believe "for better or worse" means fighting through even the worst and hoping to get back to the better. Beyond my kids, I consider often what I will look back upon at the end of my life. I will, of course have regrets - everyone will have some kind of regrets. But I hope they are petty ones. What I don't want to look back and regret is that I didn't fight hard enough to keep the promises I made or the vows I took. Often I've been told that I just don't know when to let go of someone... and there have been times that I have been so hurt and would agree with that. But at the end of my life, I don't think that will be a regret at all. I hope that is part of the legacy my life leaves to my children, grandchildren and anyone else close to me... that they remember me as someone who took "for better or worse" to mean everything it implies. And that I was a woman of integrity and perseverance. **one disclosure...I do not ever condone that "worse" includes physical or true emotional abuse... I do believe there are things that happen in some marriages that the only answer is separation - and sometimes divorce. But I simply believe as a society, we too easily look for any reason to grasp and give us a clear conscience to go that route without really fighting for what is right. And like I said at the beginning of this... I'm no trained authority. I have just lived a lot of life and learned a lot of lessons in my 45 years. What has happened to all the real friends? Do you ever wonder whatever happened to lifetime friendships? I remember when I was younger thinking that my best friends would always be my best friends...and not only that we would be friends, but that we would be active parts of one another daily lives in some way. Some people have those friends whom they have known forever - have been through the best and the worst together - and are always helping each other through those times. Now don't misunderstand me and think I don't have some friends who have been a part of my life in some way for a very long time... but truth is, there have always been very long lapses of time that have been allowed to pass without us making the time to be part of each others lives. And that kind of makes me sad! But beyond that, I'm talking more about now. I know when I was younger my Mom would tell me (as I think all Mom's tell their kids) that when I grew up I would see that true friends were few and far between - and if you had true friends that you could count on one hand then you were very blessed. But somehow I thought "no, not me...my friends and I are so close nothing will keep us from talking every day!" Well, Mom's are pretty smart. Life has a way of getting busy and often changing things or people. I look around me now and there are actually times that I really feel very alone. I have lots of friends - and I know that they would be there for me in a blink if I needed them. In fact, I have seen that in just the past year. But I'm talking about that best friend that you talk to practically every day... that you share the insignificant or silly things in your life with on a regular basis. The kind of friend that just comes over to hang out and have coffee (or a glass of wine) - and the friendship is so comfortable that they just walk right in the back door. For some reason I find myself in a period of life where I don't have that person in my life... and I must say I miss it. One thing I have learned as I've grown up, older and hopefully a bit wiser is that everything has a season. Some things in our lives are meant to be lifelong...relationships in marriage, family, children - those are not for a season, but a lifelong commitment. But friendships are often for a season. They may be there to teach us something - or for us to teach someone else something. We just might not always get the answer. From every friendship I've ever had I have learned, though. Those lessons have been so valuable in making me a better person; teaching me compassion, forgiveness and understanding; sometimes teaching me the value of boundaries. Unfortunately there have also been those friendships that I've come away from learning that I need to not trust quite so easily... and I've learned to be a stronger person from it. I have learned to appreciate all of the seasons, and I look forward the the next one when I have a best friend to laugh about the silly things with, that calls to share their day with me, or stops by for coffee and to sit on the back porch and talk for a few hours; someone that I can confide in when I need to vent (not to support me if I'm wrong, but to help me get perspective and see things from maybe another angle.) I am thankful for all of the friends who are in my life, and I am especially thankful for those who have passed through my life. They have made a difference to me and in me...they have helped me become wiser and more caring. For now I am resting in this season of quietness. My kids have needed my time a lot lately (who knew they could need you so much when they got into their 20's?) and much of my energy has been put into getting my photography business started. I've learned to appreciate the quieter times in my life and not to be afraid of them. That's usually when God is really working on something... and I have faith that whatever He has planned for me is going to be great! Let me say, that I have no idea who has ever read this blog - but I do know that a few people have simply because of the numbers. I have no "followers" (sniff, sniff!) But I'm sure I'll probably be able to tell someone has read this when they walk up to me and start looking at my feet. Should I go on to explain what I'm talking about? Last year I had a huge hurt and disappointment in my life. Again. I was let down by someone very close to me - someone who had broken my heart before and I really didn't think would ever do such a thing again. But this is life, and we are all human. And I did get my heart broken once again. Only this time I was amazed to find out how strong I had become since the last huge heartbreak. God had developed me into this strong woman - a woman who was hurt, but didn't fall apart. Rather, I was relieved to have the truth out and be able to deal with it from that point. It has been 9 or 10 months now since all of this happened, and life has changed for me in many ways. I love the new stronger woman that I came to know in myself, and I have grown more in the last 9 or 10 months than probably in the last 15 years. Already there is a lot of good that has come from this bad experience. So it is great that I didn't over-react - or do something dramatic. But maybe there was still a little bit of drama left in me...and now I have permanent and lasting proof of my reaction. Ok.... not to drag this out. I got a tattoo. If you know me then you know that this is really not my personality - in fact, probably something I've spoken out against before. Yet for whatever reason, I chose to do this. And for what it matters, I also have to say that I am not sorry that I did it. I like it - and I think it's a visual reminder to me that people can change (and I am talking about me!) Someone can go through something that literally shakes their trust for any other human, and they don't have to let their life fall apart from it, but rather they can become stronger. So now I have a tattoo on my foot... It is pretty (as tattoos go!) with delicate purple flowers and green vine. Flowers can represent something dying - but also something new and blooming... just the same as the green vine and leaves. Getting the tattoo was terribly painful - I even had to ask the girl who did it to stop about half-way through because I really thought I was going to pass out. But whenever I look at this tattoo, it makes me smile. I feel strong, capable, renewed... I know I'm ok. I'm not ashamed of it, but took the feeling of being "marked" because I was hurt in a much different way now. In the past I have often stereotyped someone who would make a decision such as this, and if you are one of those people who is like that I would like to say something to you specifically... you just don't always know why someone makes a decision that they do. Maybe it is because life is difficult for them - they've been hurt and it's their way of dealing with some of the pain. Maybe it's a way (in some manner) of letting go of some of the pain in the only way they can find at the time. I believe wholly in absolute truth - but there are many things that I believe are preference, or issues that we are to deal with for our own lives. And this is one of them. For me this tattoo reminds me that God made me strong - and He has given me new life and new chances over and over again. And no matter what anyone else does to hurt me, God will never hurt me or leave me. The damage that was done to my heart is in many ways permanent... it has left a permanent scar, a permanent memory. But it didn't kill me - and I have chosen that my reaction is to become stronger, love more, be there for others who may experience what I've been through - I will not live in shame or allow fear to keep me from enjoying my life. And I will not let anyone else steal my Joy. I can't speak about how I will feel in the future...maybe when I'm an old woman and I have a tattoo on my foot...but I hope whenever I look at it, that I smile. That I remember the change in my life that took me from afraid and beaten down - and allowed myself to live as the strong woman God made me to be. Whew...what a week this has been! This is definitely one of those weeks that can’t end soon enough. It should have been some indication to me on Monday when the day seemed to drag on minute by minute that the rest of the week would probably not end up the best either. The greatest part of it is that I’ve made it through - and I’ve learned some lessons along the way. I have learned that we do not have to give someone else the right to tear me down. That is their own issue to deal with, and I can choose whether I will let it affect me or not. This is not always in just personal relationships, but also in professional ones. Being someone who is a huge advocate in personal responsibility, I appreciate constructive criticism. Yet there is a definite difference in that and just criticism because someone is difficult or negative. This week I dealt with someone who gave mixed responses...telling me one thing, but going and reporting something different elsewhere. And that has left me very irritated because of the dishonesty, misrepresentation and unrealistic expectations. It is definitely a time that I appreciate maturity and the life lessons that have brought me to that level...because otherwise my reaction could have been much different. Instead, I am tending to the bruises and learning lessons from the occurrence. Yesterday I had a 1-yr-old to take care of all day long...I was in my role as Mimi, and that is definitely one of my favorite roles! But by the end of the day, I was dragging. I was in my early (very early) 20's when I had my 3 kids, and I kind of grew up with them, in a way. Your energy level is remarkably higher at that age than in your mid-40's (ugh - I hate that term!) But yesterday was a sweet day, and I was reminded that things had worked out best in my life with starting my mommyhood at such a young age. Now I will hopefully be able to enjoy fully my grandmommyhood (if I ever get to that place in life!) For now, I'll treasure my time with my 1-yr-old honorary grandbaby girl. There were times through the day, though, that she would actually settle down and rest. Not many, mind you, but they were there. In the middle of the afternoon I actually got her to lay down beside me on her pillow pet and she fell asleep watching Sesame Street. This gave me an hour and a half or so to get emails caught up, work on a little bit of photo editing from the weekend, and some other work I needed to catch up on. There were a few times I would catch myself just watching her sleep, and I was reminded of what is really important in this world. There are times I feel stressed because of the quiet times as my photography business is just getting started. But in reality, those are the treasure times... the days I get to spend with her making a real difference in her life and hopefully in the person she will grow up to be. So much about our lives does have that part that requires sacrifice. Motherhood certainly has a lot of self-sacrifice necessary. But there is also sacrifice involved in any relationship as well as accomplishment we set out to make. Today is a work day for me... I have 2 photo shoots, pretty much back to back but on very different sides of Charlotte. It's exciting and rewarding to do something I love so much. As I go into this day, I wonder about that babygirl today... is her day going to be better because I hugged and kissed on her so much yesterday? Or because I put down what I feel is important to get done through the day to spend the time needed with her? Because selfishly, I feel like my day will be better today because she wanted my hugs and kisses. As exhausted as I was at the end of the day yesterday, I knew in my heart I had made a difference in her life. And that is the most rewarding feeling of all. My first blog on this new page....kind of sets the mood a bit, huh? Often when I write on my Photography by DonnaKay blog, I feel a bit guilty that it's not all photography-related writing. But honestly, how boring would that be - and who i the world would want to read that? To kind of ease my anxiety over it, though, I decided to just make another route to blog about whatever and whenever. And eventually I'll close this page to only people who are brave enough to join as a follower...so I know who is reading the more personal information I decide to reveal about myself. First off... yesterday was Mother's Day. And while it is a joyful day, because nothing on this earth has meant more to me than my role as a mother, it also comes with lots of self-sacrifice -- especially in the feelings section. My feelings were hurt at the beginning of my day yesterday, and it kind of put a damper on the rest of my day. Now if anyone reads this, and if they have read any of my blogs on my other page, then they will know that I am huge in consequences, personal responsibility, etc. I also believe that while we don't always choose our circumstances (and definitely don't choose the actions of others) we always have the choice in our actions and reactions. So, while my feelings were very hurt, I also didn't let it steal my joy for the remainder of my day. On the good side, I got to spend the day with my daughter and my Mother...two of the most special women in my life! There was laughter and tears, shopping and endless talking. The tears were from missing my Grandmother, who would have made the day complete. Her untimely-exit from our world over 9 years ago has left a void, which just goes to show how much she was loved and how powerful her presence was in all of our lives. There are just not enough good things I could say about my Grandmother...there is no blog with enough blank pages. And there is no one with enough hours to read it all. For now, I will leave it at this for my first official blog on this page. My babygirl, Bailey (it would take more time than I currently have to explain exactly who this baby is...but just accept that she is my honorary 1st grandchild for now!) will be here soon to spend the day. 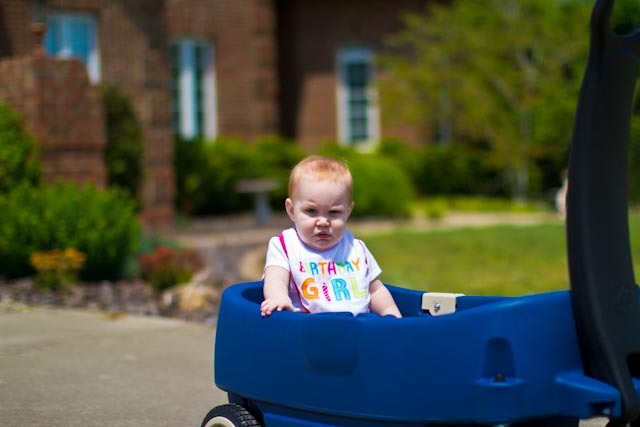 So the new wagon I got for Mother's Day -- well, I've got to get it out and get ready to put her in it! I hope you'll want to come back -- and that you'll want to reveal that you are following if you so choose! Have a great day!